I Couldn't resist the temptation to change the Appearance of the Blog for Christmas. I do love this season of the year, I had time on my hands because I couldn't sleep last night, and it just seemed like the thing to do. In the process of putting it together I learned more about modifying blogger templates. Experimenting with various aspects of web design is one of the few things that I have found which allows me to keep my mind busy while minimizing physical activity to keep my heart ticking. I really didn't have much new going on anyway. It has been a slow weekend and the weather has kept my in. Of course there is always Christmas shopping on the internet, but I have to watch that I don't overspend. OH! Did I tell you.... Jesus is the reason for the Season. Love the new blog layout! 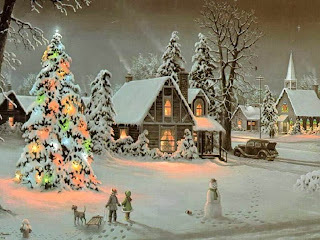 I can't believe in less than 20 days Christmas will be here!